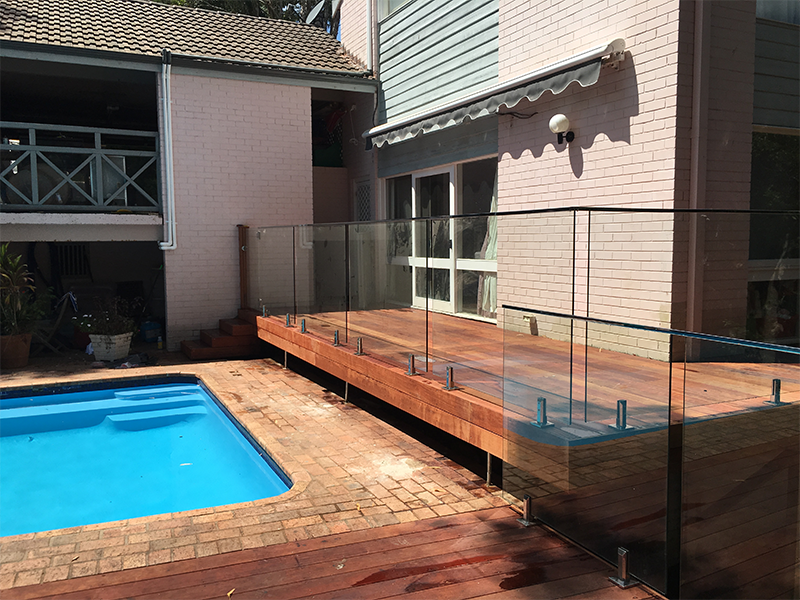 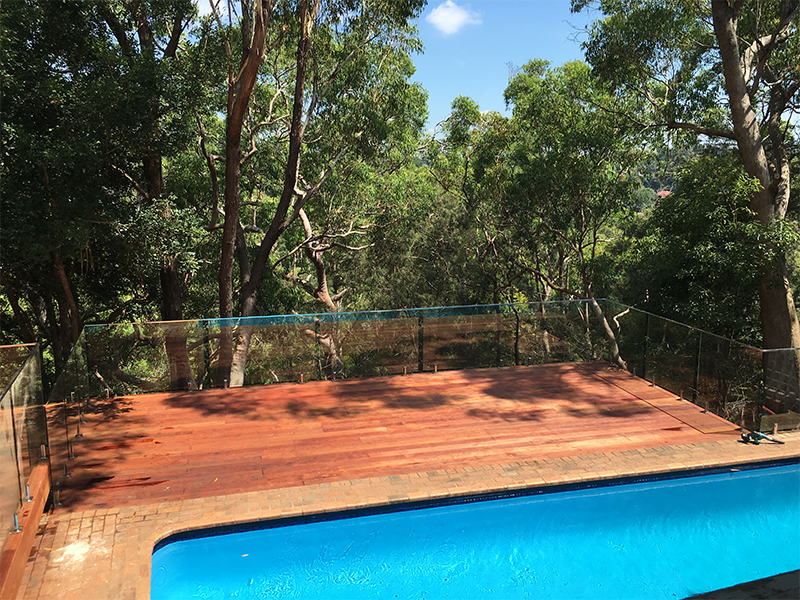 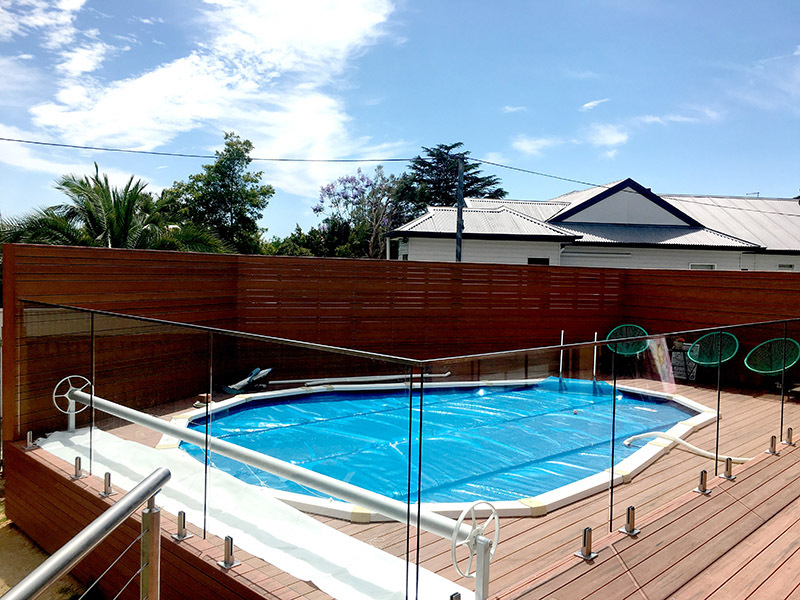 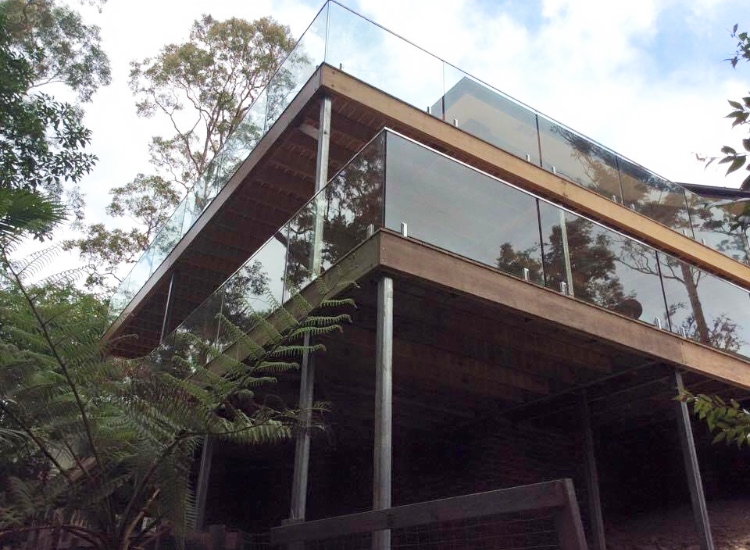 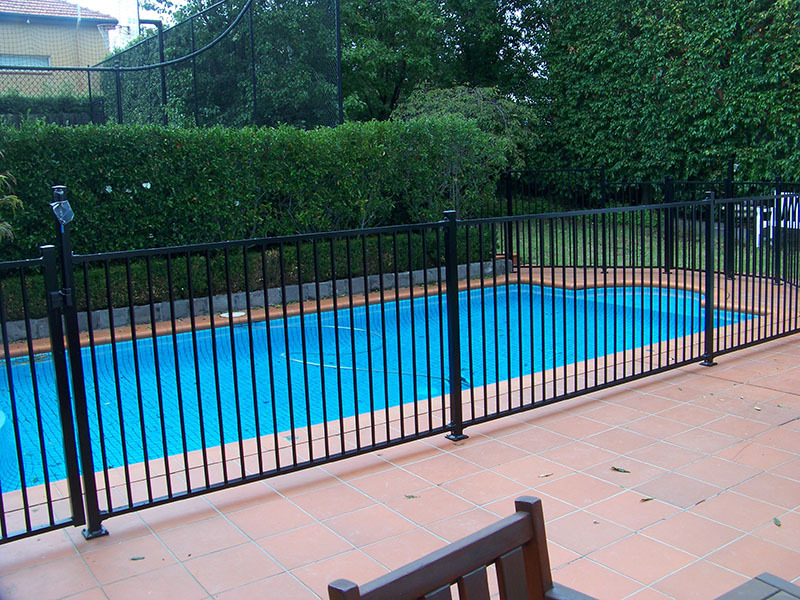 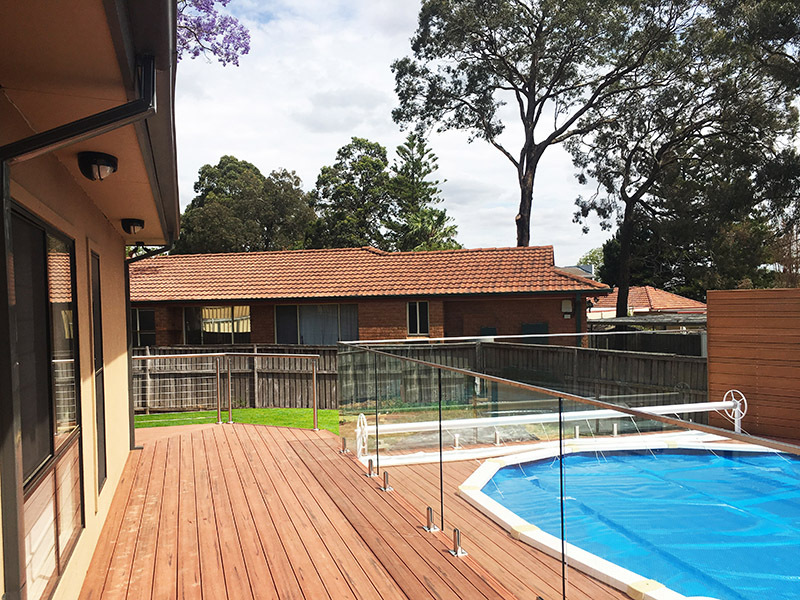 We offer various types of balustrade to compliment your deck, frameless glass, hardwood posts and handrails with stainless steel tension wires, powder coated aluminium systems and traditional hardwood or treated pine balustrades with vertical spindles and newel posts. The factors to consider when choosing the right balustrade for you are safety, view, maintenance and what look will best suit your house, traditional homes more often will be suited to hardwood or treated pine balustrades with vertical spindles, whilst more modern homes benefit from either frameless glass or stainless steel tension wire systems which can be fitted onto variety of posts and handrails such as hardwood, aluminium and stainless steel. 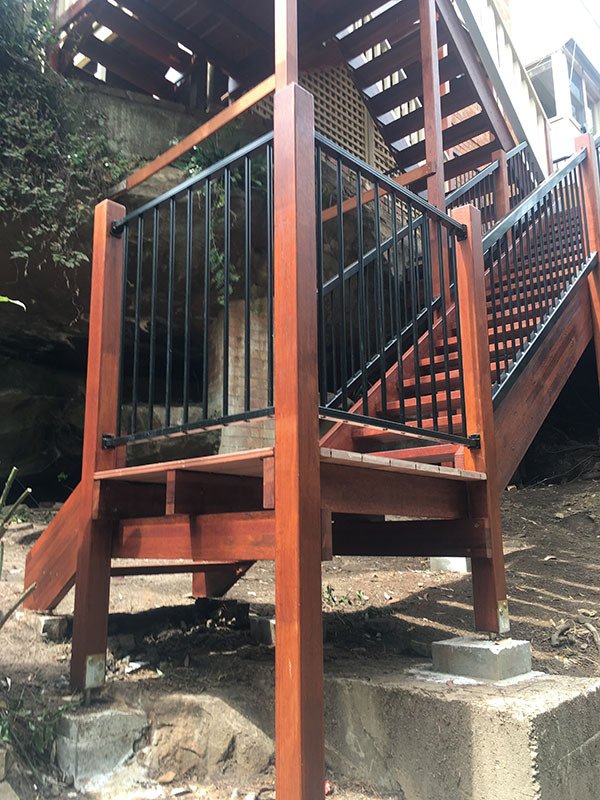 Aluminium powder coated square section spindles and handrails. 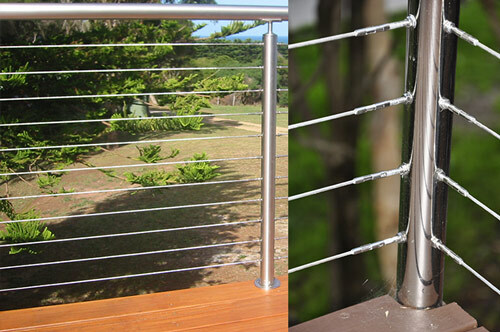 Powdercoated aluminium with stainless steel tension wires. 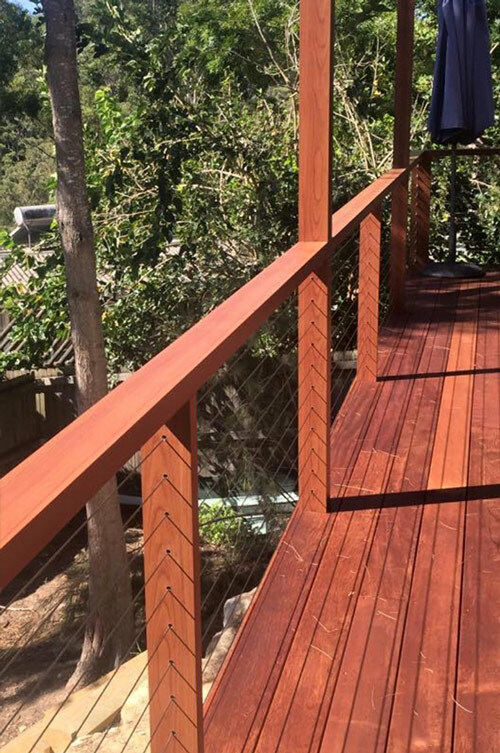 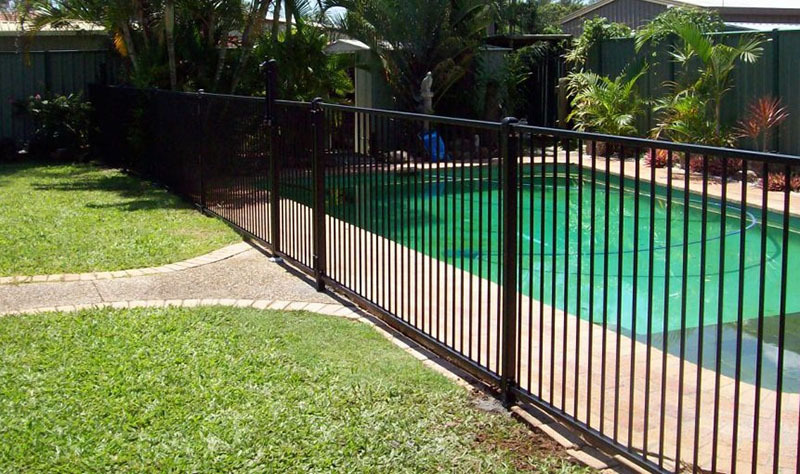 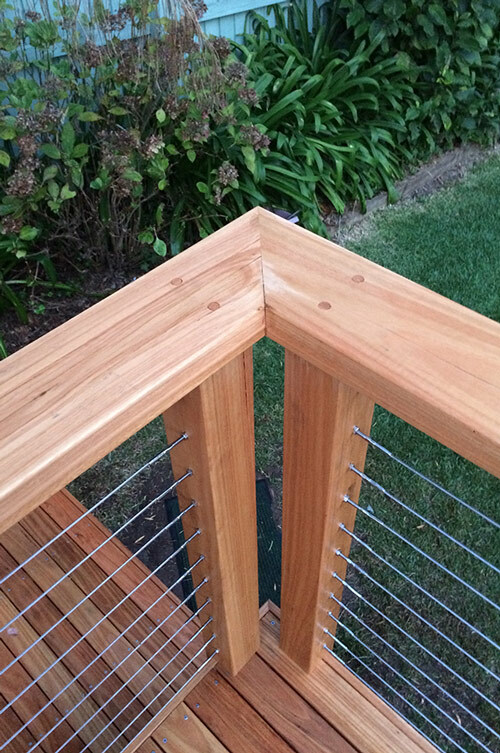 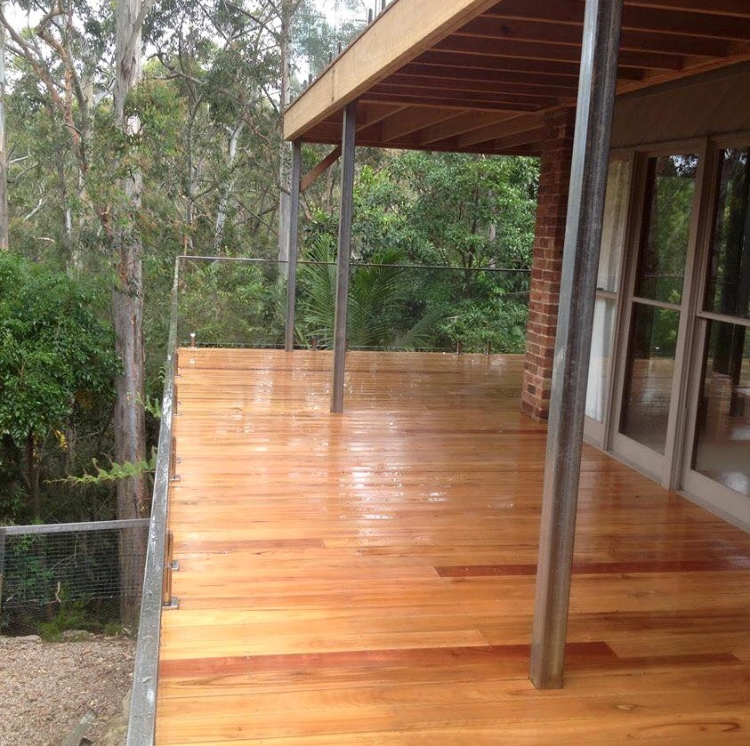 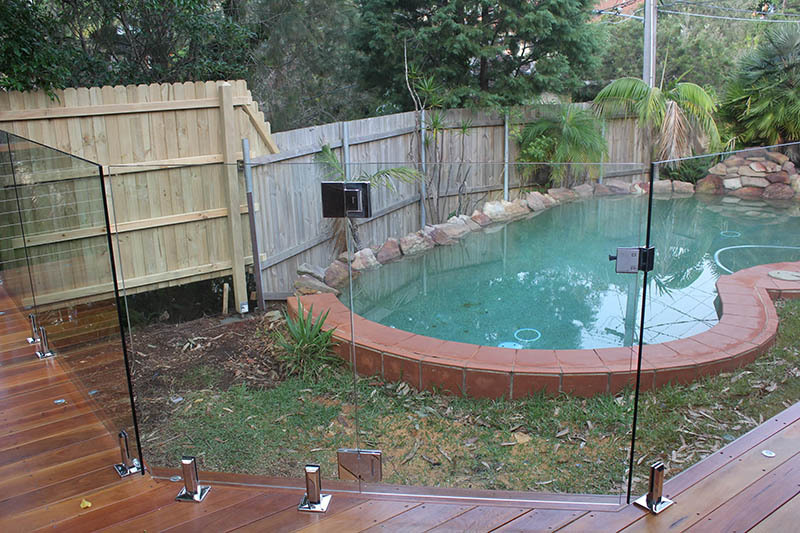 Blackbutt hardwood posts and handrails with stainless steel tension wires. 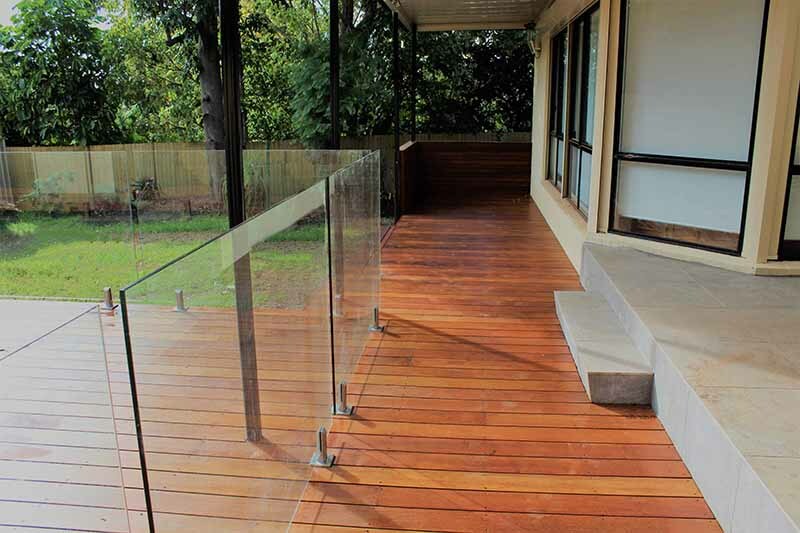 When is a handrail required? 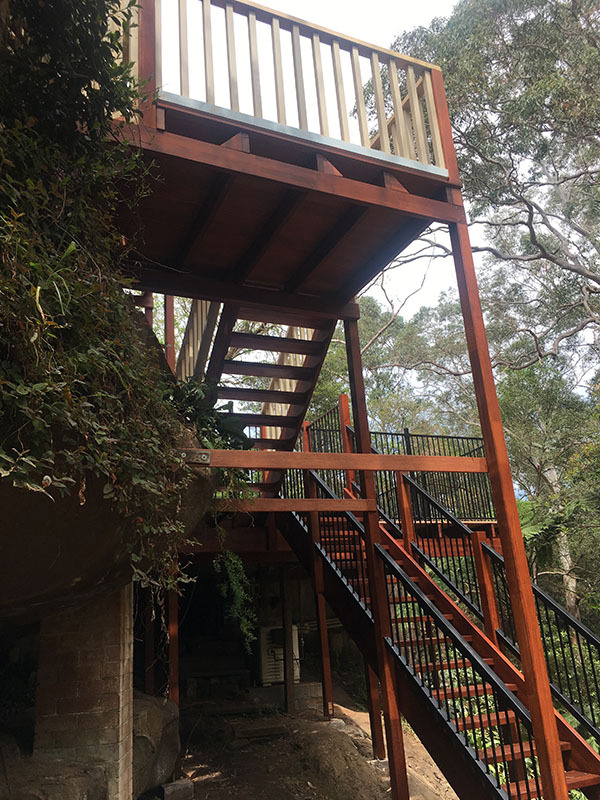 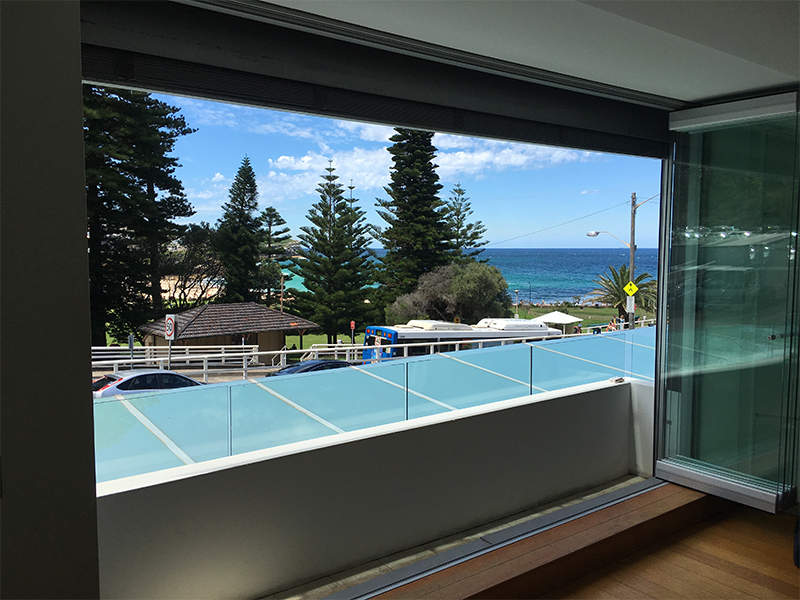 The Building Code of Australia (BCA) advises that a handrail is required where there is the possibility of falling over one metre or more from a floor or building. 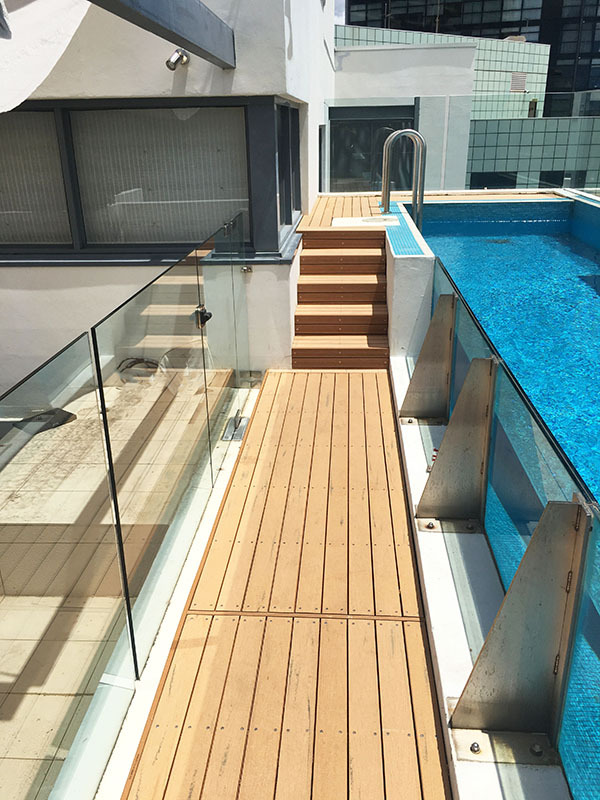 In other words, a deck less than one metre (1m) above ground is not required to have a handrail, though depending on the height it may still be recommended. 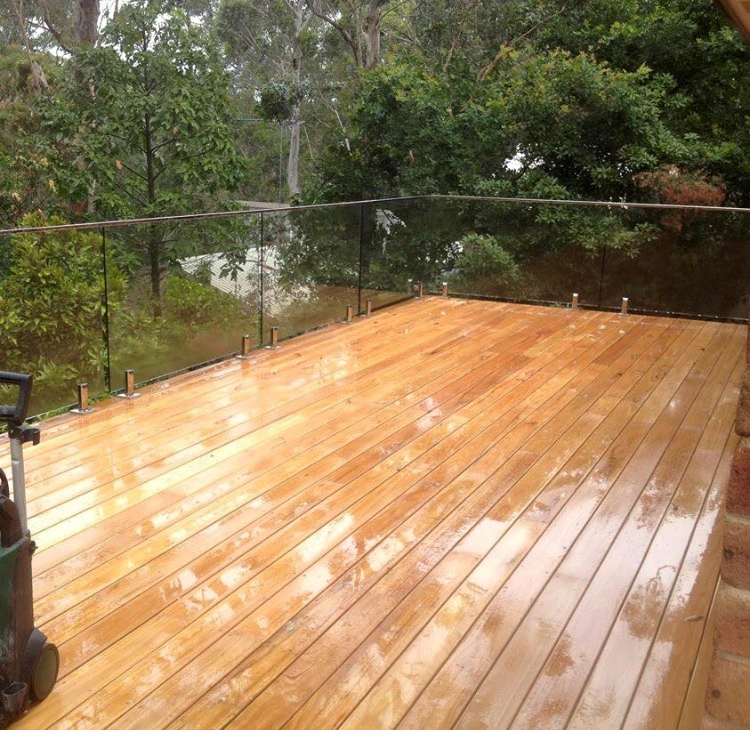 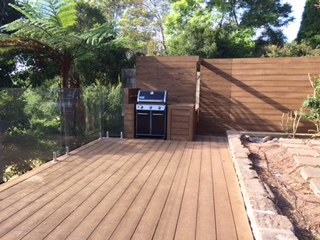 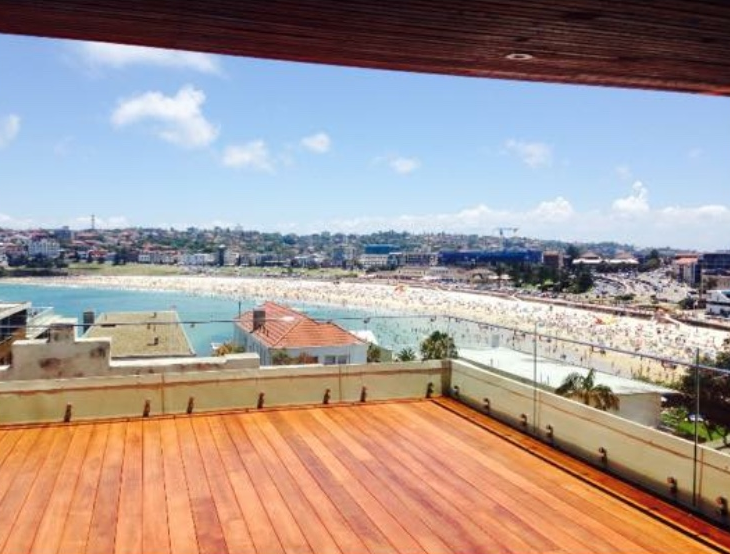 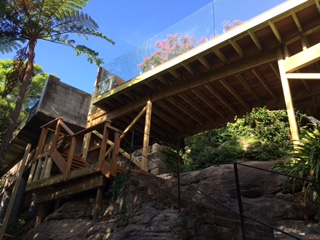 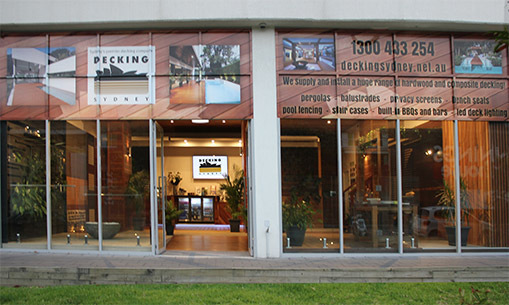 Decks four metres (4m) from the ground or higher need to meet additional design requirements. 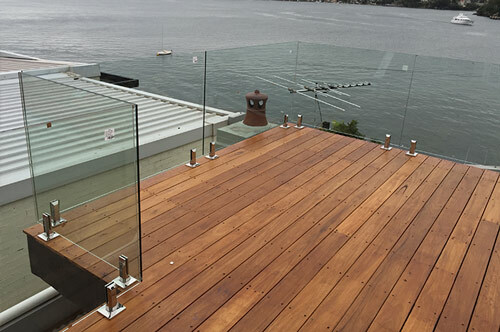 For these decks, the handrails must not have any climbable elements located between 150mm and 760mm of the floor. 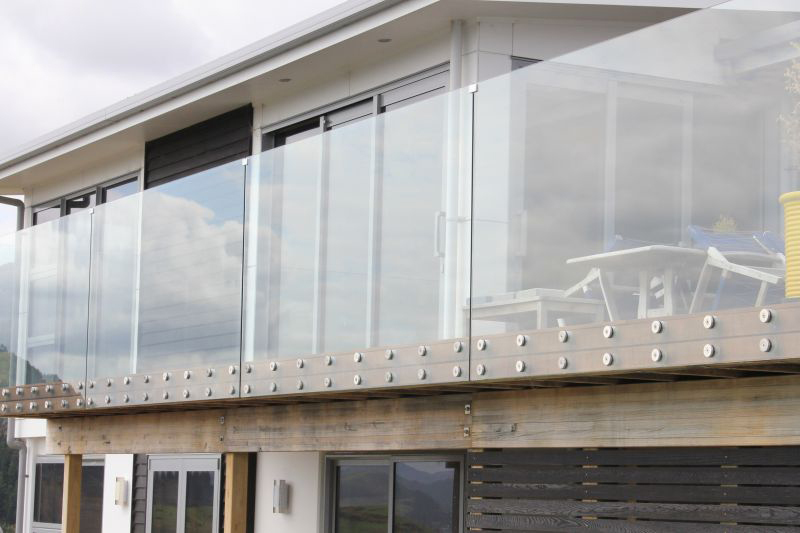 This means horizontal balustrades are not allowed to be used at this height, and vertical balustrades should have no footholds. 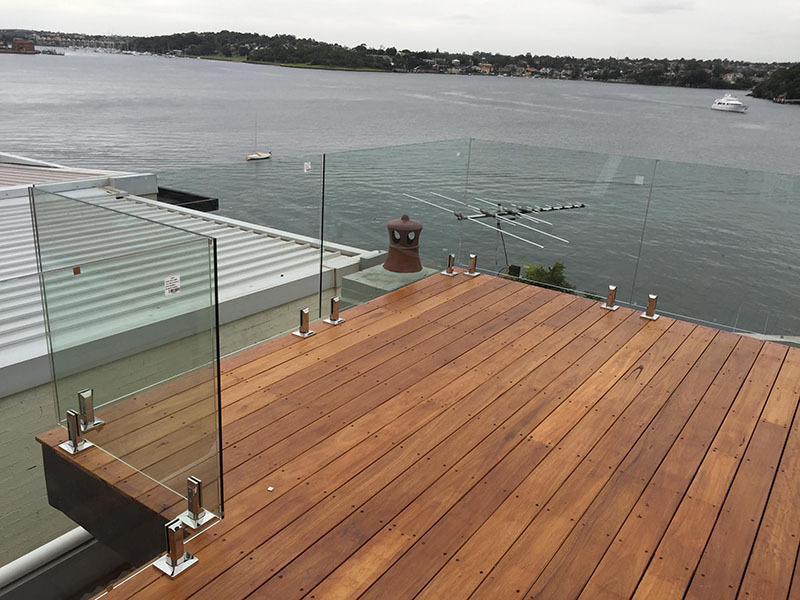 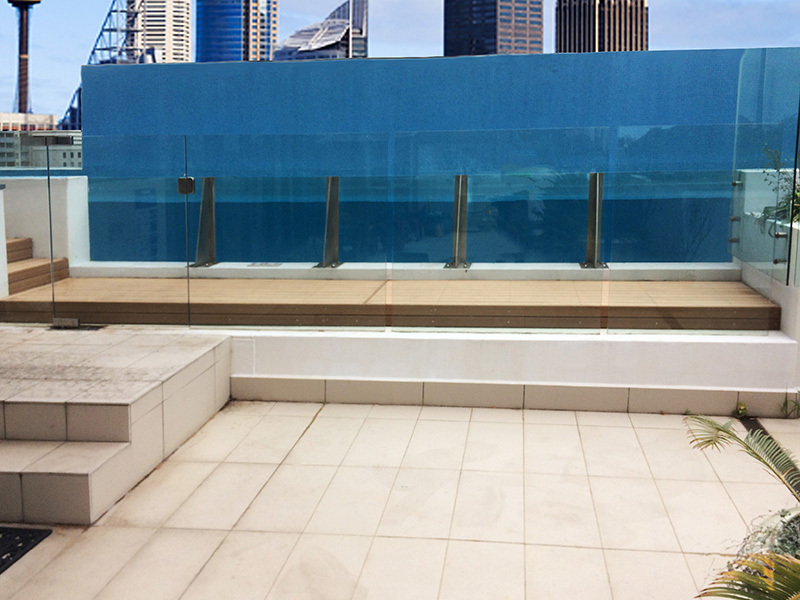 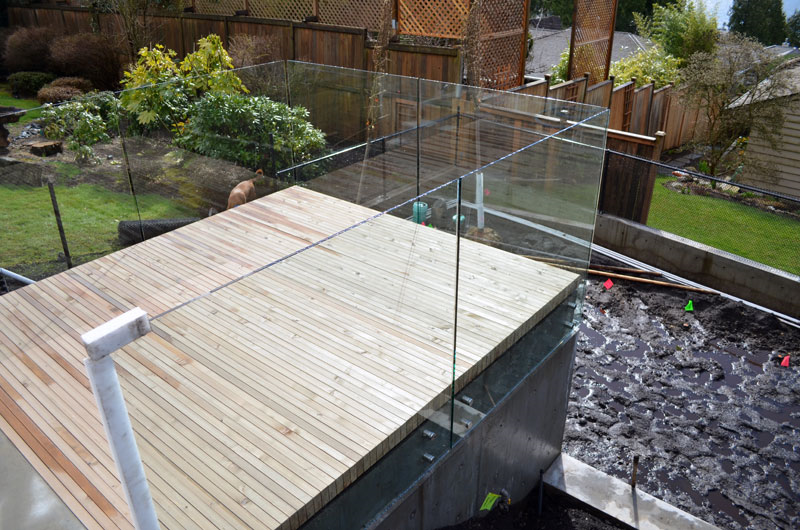 Frameless glass balustrade with marine grade 316 stainless steel deck mounted spigots. 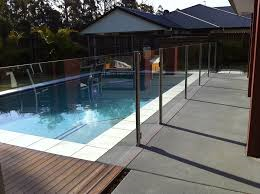 What are the regulations for a hand rail? 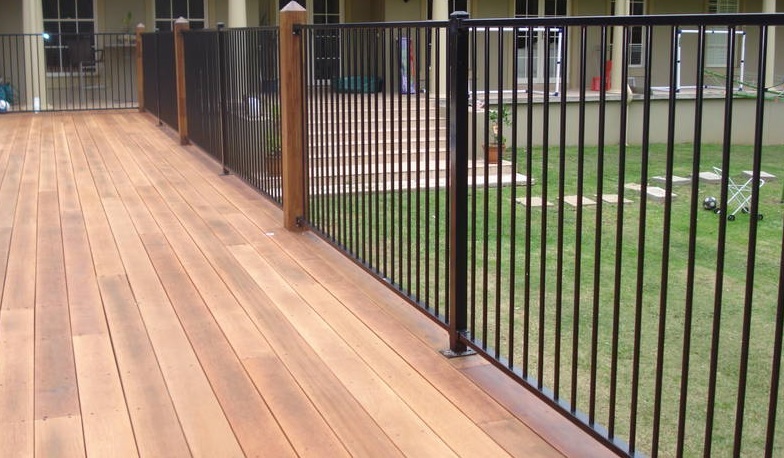 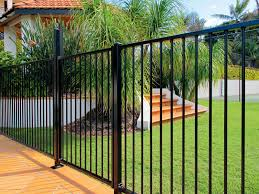 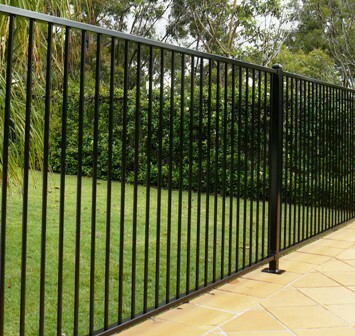 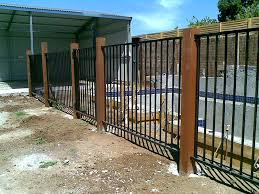 There are a number of spacing regulations that determine what materials you may use to construct a railing and where your railing components need to be placed. 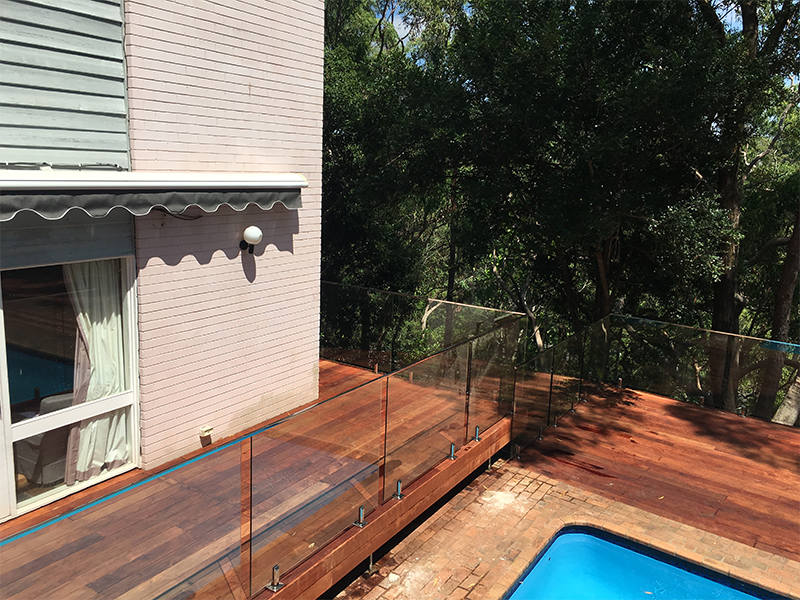 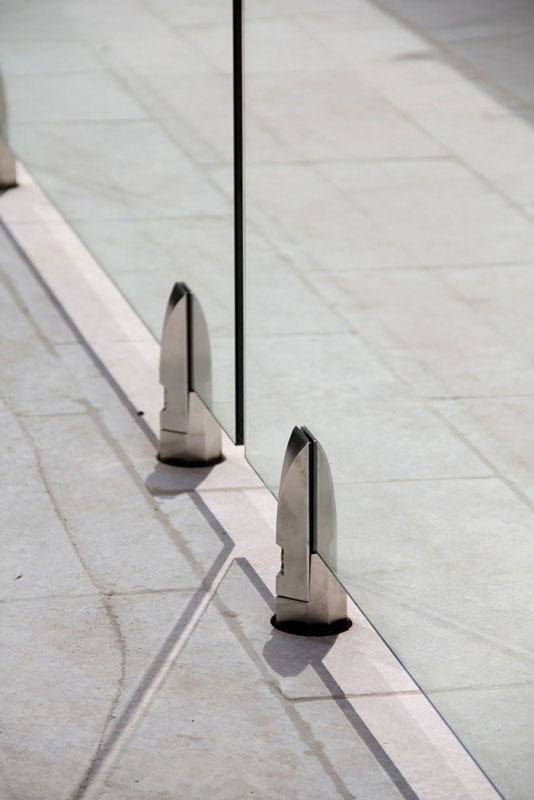 The hand rail itself should stand a minimum of one metre from the surface of the deck, with a clearance no more than 125 mm from the surface of the deck and the balustrades should have no spacings greater than 125mm to prevent large objects falling through.